On 25 February 2013, in a court in the UK, Tony Rooke related that the 'BBC has covered up the facts about 9/11'. The judge made Rooke pay £200 costs and gave him a conditional discharge. "Conditional discharges are often used in political cases to indicate that the accused, though technically guilty, occupies the moral high ground." "With the exception of London’s Daily Mail, the British mainstream media, including The Guardian and the Independent, chose to abstain from coverage or commentary of this historic court case, which points to a criminal process of media disinformation by the BBC. "Not a single word from the BBC to justify or explain or refute their lies, particularly regarding the collapse of WTC building 7 which had been announced by the BBC 20 minutes before the collapse took place, suggesting that the BBC and other media had advanced knowledge of the collapse of a WTC building 7 which was not even struck by an aircraft. "This is one among a string of BBC media fabrications including fake images and video footage. "We will recall that in August 2011, the BBC showed fake video footage of Libyans celebrating 'Liberation' in Tripoli’s Green square, following NATO’s humanitarian bombings. Oops. "They were waving Indian flags. "It is our hope that Tony Brooke’s initiative will encourage people across the United Kingdom to question the legitimacy of the TV Licence fee, which supports an organization involved in outright war propaganda on behalf of the British government." In court, Rooke said that he was withholding his TV license fee under Section 15 of the Terrorism Act 2000 which states that it is an offence for someone to provide funds used for an organisation 'funding terrorism'. Rooke was not allowed to show his video evidence in court because the Judge said it was not relevant to the trial. "The main point Rooke said he relied upon was that the BBC reported that World Trade Centre 7 had fallen 20 minutes before it did. "He also made reference to a theory about the way the skyscraper was said to have fallen in on itself, which some people believe showed signs of a controlled demolition. "Mr Rooke said: 'The BBC reported it 20 minutes before it fell. They knew about it beforehand." "Last time I was here I asked you (the judge): “Were you aware of World Trade Centre 7”? "‘You said you had heard of it. Ten years later you should have more than heard of it. "It's the BBC's job to inform the public. Especially of miracles of science and when laws of physics become suspended." "‘They have made programmes making fools of and ridiculing those of us who believe in the laws of gravity. American reports have shown that the fall was nothing but a controlled demolition. Fake news from the BBC. 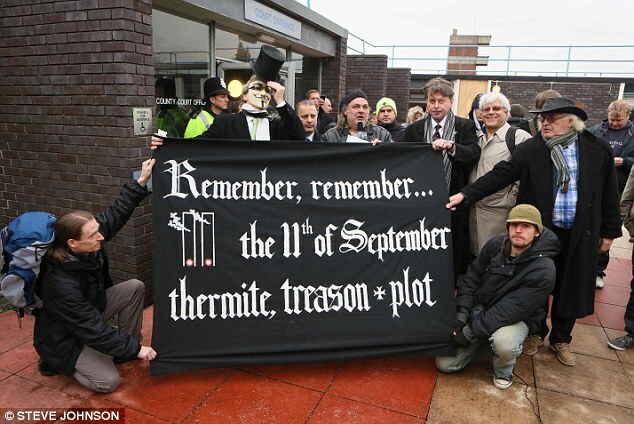 "...The court called in back-up from Sussex Police with two officers standing at the door to the court and several more outside. There was cheering and applause as Rooke put his case forward in court." A pyrrhic victory, poor sod still had to pay £200 costs yet the license fee is only £145. Nevertheless, I applaud his efforts. This wasn't really a victory because the conditional discharge is for 6 months after which I presume TR could go to jail. Another example that the UK has become a huge debtors' prison. Then the magistrates court can't deal with questions of terrorism, another waste of time, but hopefully TR has got his foot in the door. One interesting comment on the DM article - why is the BBC still a state-owned institution whilst privatising has been going on in all other sectors. Hmmmmm? 10% of magistrates courts' time in England is reputedly spent on TV licence non-payment. It should be replaced by subscription-only and the BBC given to its employees to be run as a workers cooperative, like John Lewis's, with a n-sale clause. Everything about the BBC is anachronistic and arguably, amoral. Many thanks for all the wise comments. I was at the court that day and Tony said he still isn't going to be paying for his TV license. He told all to take evidence of WTC7 to your local police station and hand it in under section 37 or 38, I can't remember. Don't worry about court costs, there was a collection for Tony and I could see paper money flying into the pot so I'm sure there was more then enough! Assuming no further offence is committed within 6 months then he has walked. No Jail. They could take him to court for non-payment again but there is a precedent now.